We’d love your help. Let us know what’s wrong with this preview of Blood Walk by Melissa Bowersock. To ask other readers questions about Blood Walk, please sign up. When I set sail with this book, I’ll be honest, I was just a smidge apprehensive: book number 8. How long can the paranormal-investigative pair keep going? Or, more to the point, how can Bowersock keep the reader interested after so many books? The changes are subtle with each adventure, but enough to keep you invested. Sam and Lacey’s personal relationship inches forward (happily) and their paranormal investigations take varied paths. And in this ‘chapter’, Sam is sta When I set sail with this book, I’ll be honest, I was just a smidge apprehensive: book number 8. How long can the paranormal-investigative pair keep going? Or, more to the point, how can Bowersock keep the reader interested after so many books? The changes are subtle with each adventure, but enough to keep you invested. Sam and Lacey’s personal relationship inches forward (happily) and their paranormal investigations take varied paths. And in this ‘chapter’, Sam is startled to discover that, abnormally, he is getting connectivity with a living person (in this case, the perpetrator of the crimes) rather than with the ghosts of he victims of tragedy. I didn’t know what to expect in “Blood Walk,” I’ve gotten used to the way Sam and Lacey work. This time Ms. Bowersock throws the reader, along with Sam and Lacey, a curve ball that changes things up with unexpected consequences. Trying to catch a gruesome serial killer who seems to not have a discernable pattern besides the disposal of his victims. The police are perplexed and welcome Sam’s mediumistic assistance. The plot moves at a nice pace as Sam and Lacey try to identify the elusive killer and plan their wedding. Lacey has amazing Google skillz that offer as much guidance as Sam’s readings. (Honestly, I don’t know if Lacey uses Google. I just wanted to say Google skillz.) 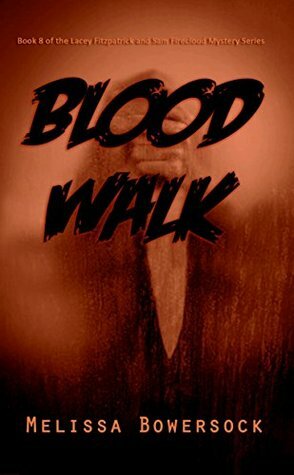 “Blood Walk” is well written with fully rounded characters and intelligent dialogue. The end of the first storyline is full of suspense, tension, and heart stopping action. The end of the story is heartwarming and may leave you with happy tears. It did me. I can’t wait for the next book. Anyone who loves mysteries with a small dose of the supernatural will enjoy this book. And the whole series.